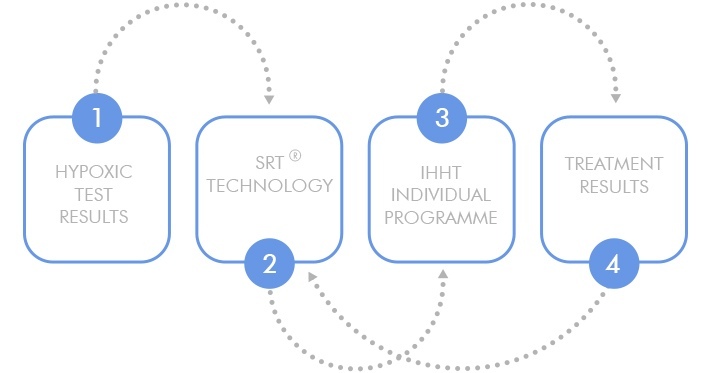 The main idea of the interval hypoxic treatment (IHT) method – cyclic reduction of oxygen in the blood to the individual level of adaptation and then returning to the original values. A reduction in a level of O2 stimulates the activity of protective proteins (e.g. antioxidant enzymes, heat shock proteins, Fe-regulating proteins, repair enzymes, peroxiredoxins, etc. by starting a cascade of reactions that leads to adaptation to hypoxia and the formation of new defensive mechanism that produce physiological changes and positive outcomes in clinical practice [Bernardi et al.]. The patient inhales air through a mask with a low content of oxygen at atmospheric pressure in a continuous mode, and periods of hypoxia (10-14% O2) followed by periods of normoxia (21% O2) and/or Hyperoxia(up to 35% O2) while working in the IHHT mode. The amount of the hypoxia is determined by the patient through SRT-biofeedback-based technology which allows the patient’s body to regulate a dose of hypoxia that is comfortable for the patient. Interval Hypoxic Hyperoxic Treatment parameters are determined after a preliminary assessment of patient’s ability to adapt to hypoxic gas mixtures, by doing the hypoxic test. Built-in intelligent software automatically identifies and suggests key treatment parameters for individual treatment programme, initially based on the results of the hypoxic test. The intensity of the treatment parameters varies within the pre-set limits throughout every procedure. At the end of each test, procedure and treatment course ReOxy generates a summary report in pdf.